(Nanowerk News) A University of Delaware research team is considering the important question of what it will take to create an affordable emissions-free car. The question, an issue of engineering and economics, is being studied by a team led by Yushan Yan, Distinguished Professor of Engineering. 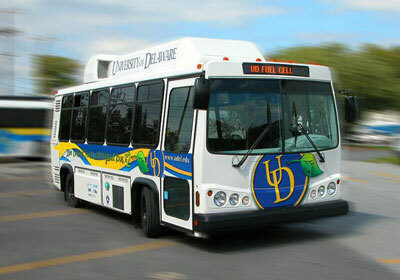 New findings could help create alternative electrocatalysts for vehicles powered by hydrogen fuel cells, such as this bus at the University of Delaware. Hydrogen fuel cells may be the best option for powering zero-emission vehicles: Toyota has just introduced a hydrogen-powered car in Japan and will make them available in the United States in 2015. But these fuel cells require an electrocatalyst -- a platinum surface -- to increase the reaction rate, and the cost of the precious metal makes it hard for hydrogen fuel cells to compete economically with the internal combustion engine. Yan's group has been working on a new type of fuel cells, using alkaline polymers that could employ a number of non-precious metal catalysts such as nickel, which is a thousand times cheaper than platinum. But using alkaline polymers leads to a high pH, and researchers have discovered that the reaction goes about 100 times more slowly in this environment that it does in an acid. In order to create less expensive electrocatalysts that work well in an alkaline environment, researchers have to know exactly how the reaction unfolds, and what its most essential mechanisms are. A paper by Yan's research group, published in the Jan. 8 issue of the multidisciplinary journal Nature Communications ("Correlating Hydrogen Oxidation and Evolution Activity on Platinum at Different pH with Measured Hydrogen Binding Energy"), helps pin down the basic mechanisms of the fuel-cell reaction on platinum, which will help researchers create alternative electrocatalysts. After extensive testing, the team found that the hydrogen binding energy (the amount of energy released when a hydrogen molecule adheres to a metal surface) was the most important factor predicting the rate of the reaction -- information essential to researchers designing new catalyst materials.